Tracie Johnson- has over 25 years experience, with a focus assiting clients with their projects. Tracie is truly professional and well respected in the industry and has not only a wealth of knowledge and expertise on how to transform a house into a home, but also is extremely detail oriented. Tracie is known in the industry for both the “wow” and “know how!” She is involved with many projects from conception to completion, taking the client through selection decisions all while working within the specified budget and / or allowances given for each step in the process. She works diligently to keep the client on track with their schedule and budget, by wisely guiding her clients through the selection process. Her keen eye for creating exciting interior details that compliment the architecture like few can. Starr Miller is the National Award Winning Interior Designer & Best of Houzz for 2018, 2017, 2016, 2015, 2014 & 2013 for Design & Client Satisfaction. The only Nationally awarded and Parsons educated designer in the area, Starr is the principal of her namesake firm. She prides herself on Connecting with Clients, Collaborating with Clients by finding their personal inspiration & bringing it to life with Captivating designs that are timeless & playful. Her work has been featured several times on HGTV's "Save My Bath" and in many national and local publications. Starr is a regular contributing columnist for Lake Norman Woman magazine. The company focuses on new construction, renovation and 3+ room design projects. Lucy and Company, is an interior design firm featured in national and local publications, on-line publications and a monthly contributing editor column in Charlotte Urban Home Magazine. With has a team of 6 and a collective 25 years in the business, they are best known for their bold, unique and one of a kind designs combining the talents of on-staff artists, carpenters, photographers and designers winning awards in Charlotte Magazine's Best of. A large showroom housing all the latest fabrics, wall papers, furniture and accessories are available to inspire you. Their website and blog gives you updates on all our new projects, installations, design ideas, new introductions to the market. Owner Amy N. Lee relocated her design business from NYC to the Charlotte area in 2007. She is a professional member of ASID and has over 19 years experience In the field. With extensive knowledge of design, construction and details, Amy strives to create custom interiors to meet all her clients needs and goals. Working side by side with her clients and subcontractors, Artistic Interiors takes pride in creating interiors for any home, style and budget. We strive to keep both the process and design solution pure. 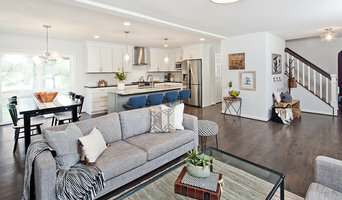 Our main goal is to guide you through putting your design together to enhance your living space, explaining the practical pros and cons of selecting materials and furnishings to make an educated decision, and navigating the construction and implementation of your project to achieve a beautiful finished product. Design doesn't have to be intimidating, cluttered, confusing or overwhelming. Aly and Dara work together to bring together great designs and projects, Aly brings a multifaceted perspective to Pure Design Works, seamlessly blending the design and business aspects of a project together. Since graduating from Queens University with a Bachelor's degree in Interior Design and Entrepeneurship, Aly has worked in several established residential firms in Charlotte where she has seen the inside workings of a small design/construction company. She is passionate about all aspects of the process from design through construction, bringing a turnkey aspect to Pure Design Works. She is both creative and logical, giving her the tools to design an amazing space for a client while keeping the process simple and hassle free. Dara brings over 15 years of residential design and construction experience to Pure Design Works. Prior to interiors, Dara studied Theatrical Production Arts and was a professional Costume Designer in San Francisco. She has worked in many aspects of residential design including furnishings, kitchens and baths, cabinetry manufacturing and exterior spaces. Her varied background gives her a unique perspective that she brings to each client. An NCIDQ Certificate holder, she is both extremely creative and practical in her design process. She enjoys working with people to help solve their functionality problems while bringing a beautiful design to their home. Delphinium Design is a design firm located in Charlotte, NC that specializes in a bright, clean, functional yet refined design aesthetic. We take pride in partnering with local tradespeople and supporting small businesses to achieve your perfect space. We work on a wide range of projects including full home renovations to custom kitchen and bathrooms. We also offer interior decorating services including space planning, custom drapery and pillows, furniture and finish selections, and paint consultations. We recognize that you are hiring us to create a space that you’re proud of and will enjoy for years to come. We work closely with you to understand your personal style, budget, and timeline while collaborating with the contractor, architect, cabinet maker, etc. to curate your perfect space. What’s in a name? The Delphinium flower symbolizes infinite possibilities, good will towards others, attracting new opportunities, and enjoying the little things that life has to offer. This philosophy is embodied in every project we undertake. 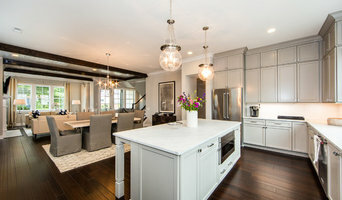 Best of Houzz Design & Service 2019 Winner! We offer full-service home remodeling & design, specializing in residential interiors throughout Lake Norman, North Carolina. We believe in enduring style and spaces that are highly personal. Through our signature design approach, we develop a comprehensive design plan suited to each individual project resulting in comfortable, luxurious spaces reflective of our clients’ tastes, interests, and lifestyles. Custom Home Building Interior/Exterior Design Specialist. Professional design services for builders clients with interior /exterior selections for during custom home construction. Offering a superior design experience while assisting with design coordination, budget, and the interior/exterior selection process. Building a new home can leave you overwhelmed with all the color and product decisions to be made. Let a professional that specializes in the new home custom construction guide you. Building a new home means you have the luxury of starting fresh and making all the selections to personalize your home. This will be the core of your design direction so you'll want to make the choices that will enhance your future design vision. It is also important to know which upgrades will add value to your new home and other options that can be added later to keep you on target with your budget. A professional can assist you with design, color coordination, decorative style, and the types of products that will best fit your lifestyle now and in the future. For my Builder partners I am able to streamline the buyer's selection process by saving time, money, installation errors and production delays. I will take your buyer through vendor appointments on time to meet your production schedule avoiding costly delays. I will guide your buyer with design assistance, extensive product knowledge, current trends and practical advise to meet their lifestyle needs. Giving the the buyer the confidence to make final decisions and minimizing costly change orders along with a superior design experience. Custom Cabinet Shop building the highest quality cabinets tailored to your design preference and budget. Based in the Lake Norman region, Vine & Branch Woodworks manufactures fine quality, custom cabinets, custom furniture and decorative wood products for residential and commercial clients throughout the Southeast. Whether you’re looking for traditional hand-crafted cabinetry or have a unique wood project in mind, we combine exceptional craftsmanship and affordable pricing with some of the shortest lead-times in the industry. Beautiful kitchen, bath and office woodwork tailored to your needs, style and budget. Vine & Branch Woodworks brings your wood, your space and your vision to life. Cabinets and cupboards are crucial organizational components of any kitchen or bathroom. Yet, for such an essential element, homeowners often compromise on their cabinetry, settling for cabinets that neither complement their style or meet their needs. 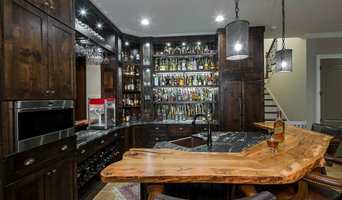 Custom cabinetmakers in Denver, NC has the transformative power to create a practical yet personalized space unique to you by creating custom cabinets that have all the storage elements you need as well as the stylistic ones. Custom cabinets have the benefit of being designed specifically for you in terms of both appearance and usability. When it comes to stock cabinetry, you are limited to generic, cookie-cutter designs, dimensions and colors, which isn’t ideal for outfitting a uniquely shaped kitchen or for showcasing your personal style. Custom cabinets are solely crafted based on your specifications and needs, and while they are pricier than pre-made pieces, you’ll receive a higher level of craftsmanship and durability when you work with a professional on Houzz who specializes in custom cabinets in Denver, NC. Create an ideabook on Houzz and save examples of the custom cabinets you want — this will help your Denver custom cabinetmaker get on board with your vision and make your design a reality. Additionally, if you are undergoing a remodel, keep in mind that a blueprint needs to be finalized prior to any kind of cabinet building and installing; given the one-of-a-kind nature of a custom cabinet, room dimensions need to be completely finalized before any work can commence.